$49,900 USD Ready for Entertaining! Size: 1,500 sq. ft. "m/l including lanai"
Located in friendly Buccaneer Estates this 1980 WEST is ready for you. The total square footage is a little over 1,500 sq ft including the Florida room with glass windows. 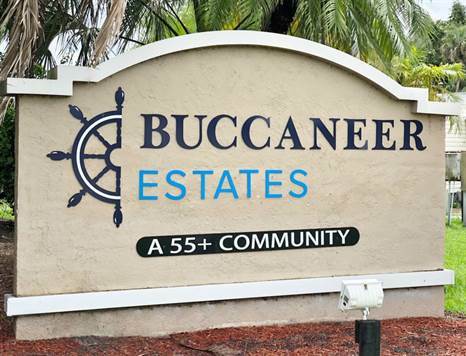 Neighbors of this home have declared themselves best neighbors in Buccaneer Estates! This home will be partially furnished, with all major kitchen appliances, low maintenance, large carport, 2 spacious bedrooms and the master has a private bath. There is plenty of room for golf cart parking. !!BONUS!! Brand NEW A/C, Bamboo Flooring, updated landscaping, NEW kitchen faucet, and some super cool accent walls! Lot rent is approximately $700 and includes lawn care and use of all amenities. Other fees are pass-through tax, water, sewer and trash and add approximately $80 to monthly expenses. APPLICATION REQUIREMENTS: $50pp, Credit Check (perfect credit is NOT required), Criminal Background Check (no felonies), Income Verification (3x’s the monthly lot rent).